Tariff ~ From £35.00 per person per night bed and breakfast. The Ferns is a beautiful 4 Star, Victorian Guest House situated in centre of Betws-y-Coed, right in the heart of The Snowdonia National Park. Only a short stroll away from the Guest House you will find the Restaurants, Shops, Golf Course and Railway Station. This friendly, family run Bed and Breakfast, originally built in 1884 as Self-Catering apartments, has now been transformed over the years into a beautiful, country style Bed and Breakfast that now offers a very high standard of service and accommodation. The Ferns has 7 en-suite letting rooms, all attractively furnished. Particular attention is given to the matching soft furnishings and those little extras to help make your stay more pleasurable. With a choice of twin, double and family rooms, we are able to accommodate individuals, couples, families or large parties. Your hosts will ensure the best of service in a friendly and informal atmosphere. Private Parking is available for guests at the front and we are strictly Non Smoking throughout. 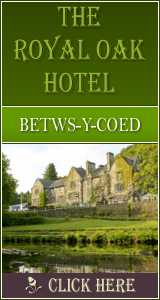 The Ferns Bed and Breakfast, Betws-y-Coed was also selected for the Editors Top 20 list in the Which? Books The Good Bed and Breakfast Guide – the only way to be included in this guide is to be selected following an independent inspection. 754 Click Throughs => �377 Since 23/Jun/2016 based on an example �0.50 cost of a click through from Google pay per click. The click through ratio to this accommodation provider's own website Since 23/Jun/2016 is 18% .